For both men and women, fashion and beauty have become a way of life. They will enjoy regular visits to the salon in an attempt to keep themselves well-groomed. Sometimes, though, it may be impossible to go to the salon to get the look you want because of time and budgetary constraints. However, if your hair is a bit long, styling it may be just as difficult as styling hair that is short. This article will explore how to curl long hair and provide you with a step-by-step instructional guide. Long hair poses a challenge to non-professionals because it is usually a bit difficult for the iron to hold all the hair strands at the same time unless it is an iron with a really big barrel. But that too can pose some difficulties for novices. If you want glamorous shiny curls to glam your look, you should not be disheartened yet, nor should you resort to spending hundreds at the salon. As with everything in life, curling your long hair will require some practice. The first step is knowing the many different types of tools used in curling hair. There are several tools that you can use to curl your hair. Some of them are traditional, and some of them you may not be too familiar with. Similarly, there are also non-heated techniques that you can use to curl your hair. The most popular device for curling your hair is, obviously, a curling wand or curling iron. They are available for purchase in different barrel sizes. Generally, the smaller the curling wand, the smaller the curl it will create. On the other hand, the larger the wand, the larger the curls. The wands can be traditional or fully automatic with a spinning barrel that requires less hand movement. Alternatively, hairstylists may also use a flat iron to curl your hair. Then again, it may be a bit more difficult to accomplish as it requires that you get the proper hand techniques to bring out the curls. 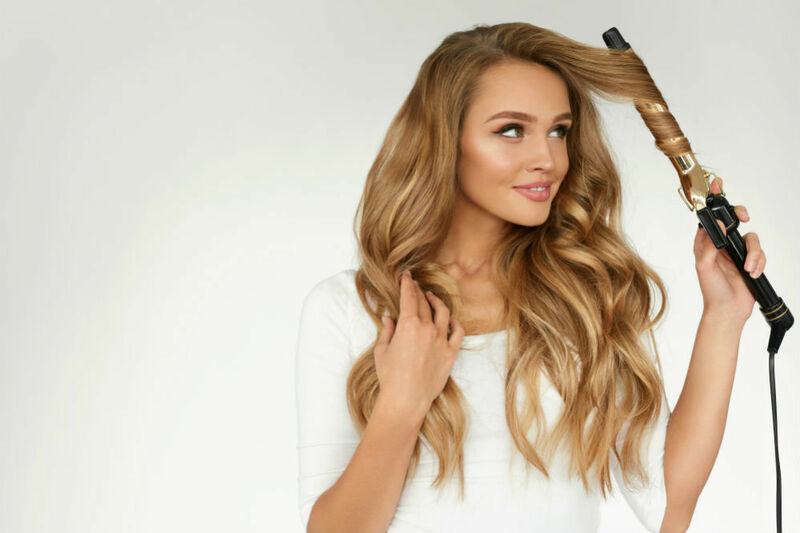 Both a flat iron and curling wand may also have a built-in ceramic feature to give you a shiny finish and to prevent your hair from frizzing. If you don’t want to use heat, then you can try hair rollers or curlers. These don’t give instant curls and have to be left in for some time. You can also use a sock bun. However, this will also need to be left in your hair for some time. The steps outlined below will describe how to use specific curling tools to do some basic curls on your long hair. For a curl that is wide and that has lots of volume, use the flat wrap technique. If you want your curls to be tight, you will have to use smaller sections of hair. Step 1. Section your hair into 1 to 2-inch parts. Before you grab the section you wish to curl, you can add a bit of heating spray and use a wide tooth comb to distribute it evenly throughout your hair. Step 2. Decide on the direction of your curl (away from or towards your face) and wrap the section of hair around your curling iron. You should not twist your hair around the iron but keep it flat until you get to the end. Release the iron after a few seconds. If you are using an automatic curling iron, the process should be a bit simpler as the tool was designed specifically to assist newbies with hair curling. The mechanism is similar, but the barrel catches and rotates your hair. As we have mentioned above, there are also some hairstylists who prefer using a flat iron when curling long hair. However, this may require lots of practice. Here is how you can do it. Step 1. Section your hair. When using a flat iron, you will need to section your hair similarly as well. Step 2. To get a good curl, place the iron diagonally on the sections. Step 3. When you close the iron, slowly rotate (about half a turn) and slide the iron down your hair to achieve the curl you want. Step 4. When you are finished with all your sections, use your hands to shake the curls. A less traditional method of curling your hair will involve the use of rollers. However, this method would take you hours to achieve the curl you look. Step 1. Divide your hair into sections, no more than two inches thick. Step 2. Starting at the end of the section, spray some leave-in conditioner or apply a water-based product to your hair. Step 3. Roll your hair onto the rollers up to where who want your curls to start. Use the clip to hold your rollers in place. Step 4. Once you’re done, you can use heat to speed up the process. If you prefer not to use heat, your curls will be ready in about an hour’s time. You can also leave them in overnight. Choose quality tools. To prevent your hair from heat damage when using an iron, you should use an iron that is made of high-quality Ceramic, Tourmaline, and Titanium irons are the most popular flat irons that are used because compared to inexpensive irons, they heat evenly and are unlikely to burn your hair. They also produce negative ions to smooth your hair cuticles and boost their shine. Utilize the temperature settings. Most irons are also designed with temperature controls. If your hair is color treated, you should not exceed 392 F to keep your color safe. Thinner hair requires a lower heat setting compared to thick strands. Protect your hair. You should always use a heat protectant when using a heated tool. It prevents the heat from drying out your hair and destroying its integrity. Do not curl wet hair. You should never use your heated appliance on hair that is wet as the heat will literally boil your hair shaft. Use the right shampoo. Just for general hair care, you should also use a moisturizing shampoo to keep your hair hydrated, and it should be sulfate-free. Condition your hair regularly. It is also recommended that you deep condition your hair weekly and use hair oils. Give it a treat! Regular hair trims are necessary to prevent split ends and hair breakage. Whether they admit it or not, many of your glamorous friends will tell you that curling your hair is a very demanding process and it takes up a lot of time. However, now that you know how to curl long hair, and with enough practice, you will become better at it, and curling your hair will become second nature. Getting long curls can be accomplished by either using a heated iron or a set of the traditional rollers. If you are going to use your iron frequently, it is important that you follow the hair care advice above to prevent further damage to your hair.